Find answers to some frequently asked questions about climate change. (for example, an increase or decrease in extreme weather events, such as hurricanes, droughts or floods) over periods of time ranging from decades to millions of years. The terms “climate change” and “global warming” are often used interchangeably. However, global warming pertains only to the average increase in the Earth’s surface temperature, while climate change covers a wide range of potential changes in weather patterns, including changes in temperature and precipitation. Among other impacts, climate changes can negatively affect habitat by creating changes in average temperatures and precipitation that may make it difficult for plants, animals and humans to survive. Greenhouse gases produced by humans, mainly through the burning of fossil fuels (for example, coal, oil and petroleum products like gasoline), are a significant contributor to modern climate change. Climate is the average weather over a long period of time. It is long-term, covers a wide area, changes gradually and is an average of weather over many years, typically assessed at 30 year intervals. Weather is the current or short-term state of the atmosphere. It affects a limited area, changes rapidly and is happening now. Weather includes measurement of temperature, precipitation, humidity and wind, among other conditions. What is a greenhouse gas (GHG)? Greenhouse gases (GHGs) are gases that absorb and trap heat in the atmosphere. Carbon dioxide (CO2) is the main naturally-occurring GHG. The most common human-produced GHGs are CO2, methane (CH4) and nitrous oxide (N2O). GHG emissions result from the burning of fossil fuels for residential and industrial purposes (producing mainly CO2), from agricultural and oilfield activities (mainly CH4), and from vehicle emissions (mainly CO2 and N2O). GHGs are also emitted from natural sources such as volcanoes and forest fires. Water vapour is another important GHG. All GHGs released to the atmosphere contribute to the greenhouse effect, regardless of where in the world they are emitted. 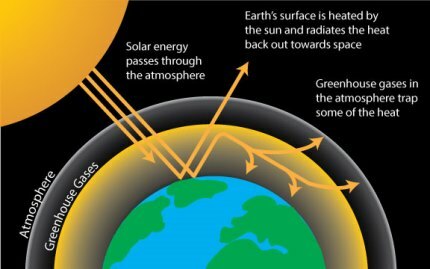 The greenhouse effect is a naturally occurring phenomenon in which GHGs in the atmosphere absorb and trap heat energy that is radiated back from the Earth’s surface – like wrapping a blanket around the Earth to keep it warm and habitable. However, human activities are adding more GHGs to the atmosphere, interfering with the natural carbon balance, increasing the greenhouse effect and raising the Earth’s temperature. These increased temperatures can lead to more frequent and extreme weather events, which can be associated with climate change. Mitigation refers to efforts that slow climate change by reducing or preventing the release of greenhouse gases to the atmosphere. Edmonton’s mitigation plan is outlined in Edmonton’s Community Energy Transition Strategy. Being carbon neutral means balancing the amount of CO2 emitted to the atmosphere with actions to reduce or offset these emissions in other places, so the net effect is zero carbon emissions. For example, a community might plant trees to absorb GHG emissions that are produced as we heat and power local buildings. Thus, although GHGs are emitted, actions are being taken to reduce the net emissions, moving us closer to being carbon neutral. When talking about carbon neutrality, the terms carbon, carbon dioxide and greenhouse gas emissions are often used interchangeably. Adaptation is about lowering the risks and negative impacts, and embracing potential opportunities associated with climate change so that communities and ecosystems are prepared to cope with new climate conditions. Edmonton's Adaptation and Resilience Strategy (in development) will examine the resilience of Edmonton, its people and services, to climate change. Adaptation is about the actions we need to take to become more resilient. Resilience is the capacity of a system to survive and thrive under changing conditions, and to maintain its functions during change. Resilience is the outcome the City is striving for, which can be achieved by thoughtful implementation of identified adaptation actions. What is a "climate shock" or "climate hazard"? Acute, short-term shocks, called “climate hazards,” are severe weather events that already occur, but may happen more frequently and with greater intensity as a result of climate change, such as flooding, freezing rain, hail, high winds or tornados. What is slow, onset climate stress? Chronic, slow onset stresses occur only because of climate change, and include glacial retreat (melting glaciers) and ecosystem shifts (defined as a change in habitats, species types, migration and so on, that result from a changing climate). What is an ecosystem shift? An ecosystem shift is defined as a change in habitats, species types, migration and so on, that result from a changing climate. An example is that with the models showing a drier, hotter Edmonton in the 2050’s, this northern city will be better suited for plants and trees that require less water and can thrive in higher temperatures than the vegetation that grows here now. What are assets and service areas? Assets and service areas are terms often used when describing how climate change might impact Edmonton, or any other community. Assets are the infrastructure, or physical pieces of equipment and buildings required for the city to run smoothly. Roads, street lights, power lines, pipes, storage buildings, recreation centres, sports fields, and so on are all considered to be assets. Service areas might be described more as how a city functions, such as ensuring social services are accessible, people have access to recreation, access to clean drinking water, etc. The services are usually tied very closely to the assets, for example, having an emergency management plan that can be implemented will rely on having assets such as communication lines, accessible roads, fueling stations, vehicles - to name a few - to ensure the plan can be acted on.